I journeyed to the American states of Tennessee and North Carolina in the fall of 2016 in search of splendid fall foliage. 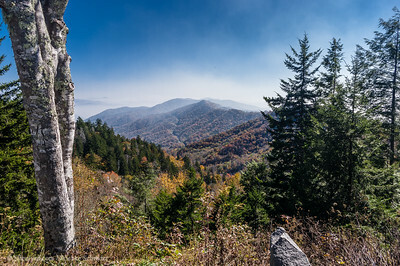 Colors had not reached their peak in Great Smoky Mountains National Park due to a persistent drought on the west side of the range so I continued north on the Blue Ridge Parkway and was rewarded with some spectacular views. Tragically, fires devastated the area within weeks of my visit. Music City Bikeway, Nashville, Tennessee, United States The Nashville Music City Bikeway is a 26mile long route from Percy Priest Dam to Percy Warner Park through Nashville, mostly on greenways. uuid="5B102F13-D86E-4552-BF6F-6EBAB9B6EC7A" id="United States lilleulven.com _K3_2825-2-2-2.dng Southern USA Lilleulven.com"
Cocke County, Hartford, Tennessee, United States of America The Tennessee Welcome Center in Hartford nicely decorated for the season. uuid="804D5DC2-1338-4361-B9CE-3EB90015DF48" id="United States of America lilleulven.com _K3_3605-2.dng Southern USA Lilleulven.com"
Hamilton County, Chattanooga, Tennessee, United States of America We decided to visit Ruby Falls in Tennessee but not to go on to Rock City Gardens a few miles further south in Georgia. 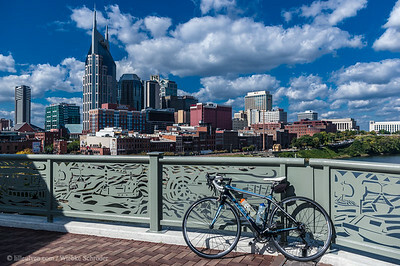 With the haze and the clouds that we had seen, the view from Rock City Gardens did not seem promising to us. 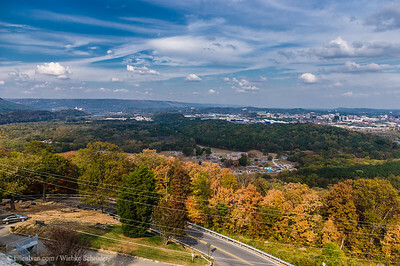 But I took my chance after our visit to Ruby Falls to take some photos of Chattanooga from the balcony. uuid="15FEBF9B-2002-4812-B44D-62A901DF9872" id="United States of America lilleulven.com _K3_3881.dng Southern USA Lilleulven.com"
Sequatchie County, Dunlap, Tennessee, United States of America We decided to visit Chattanooga and the Ruby Falls for a day. On our way along the 111 we found this beautiful overllok and resting place. uuid="9F69A58A-E269-4B4D-8533-4141F2102936" id="United States of America lilleulven.com _K3_3818-2-2.dng Southern USA Lilleulven.com"
Haywood County, Maggie Valley, North Carolina, United States of America Plott Balsam Range, where on one of the eastern slopes a German immigrant's son, Henry Plott, made his home in the early 1800's. In this area, Henry Plott and his descendants, developed the famous Plott Bear Hounds. uuid="658937BB-1C28-4013-89E9-8406053235CE" id="United States of America lilleulven.com _K3_3521.dng South-Eastern USA Lilleulven.com"
Blount County, Townsend, Tennessee, United States of America The hunt for the best fall foliage led me to visiting the Great Smoky Mountains National Park. While usually at this time of the year the fall foliage would have been at its peak, this year it was delayed by a month due to an ongoing drought and almost daily heat records in September and October. But another wish of mine, photographing in Cades Cove with some fog came true before I left the National Park to continue my journey on the Blue Ridge Parkway. 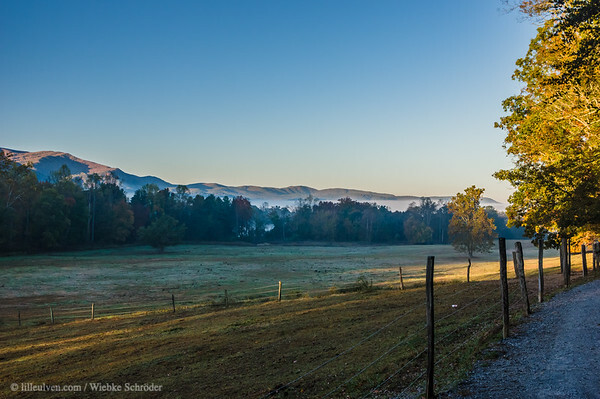 The Cherokee Indians used the valley of Cades Cove as a hunting ground and established a settlement, known as Tsiya'hi (Otter Place) here prior to 1800. The Treaty of Calhoun in 1819 ended all Cherokee claims to the Smokies and Tsiya'hi was abandoned. 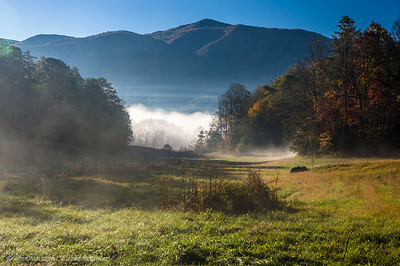 But Cades Cove derived its name from the Tsiya'hi leader Chief Kade. The first permanent European settlers arrived in 1818. After Cades Cove was included into the Great Smoky Mountains National Park the modern structures of Cades Cove were torn down, while the primitive structures, indicative of pioneer life in earlier Appalachia remain. 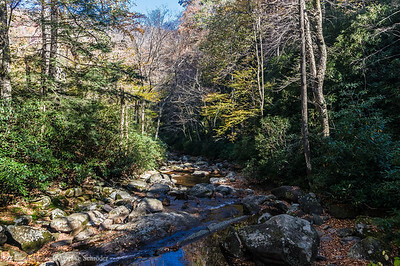 Source: Smokies Adventure uuid="A7A845DD-1336-4DC6-900C-696D9BF07A85" id="United States of America lilleulven.com _K3_3256-2-2-2-2-2-2.dng Southern USA Lilleulven.com"
Sevier County, Gatlinburg, Tennessee, United States of America uuid="69CDDCD4-4401-4BC1-863B-EEDBF2C1FC36" id="United States of America lilleulven.com _K3_3016.dng Southern USA Lilleulven.com"
Music City Bikeway, Nashville, Tennessee, United States The Nashville Music City Bikeway is a 26mile long route from Percy Priest Dam to Percy Warner Park through Nashville, mostly on greenways. uuid="DE0303F6-0B9F-425D-8BCD-674A4C39A30E" id="United States lilleulven.com _K3_2843-2-2-2-2-2.dng Southern USA Lilleulven.com"
Davidson County, Nashville, Tennessee, United States of America Before meeting up with some friends in Nashville for lunch, Solo took me for a hike to Percy Warner Park. The park was a little more crowded than what we would have expected, not only caused by the good weather but also by an ongoing race, but we still had a great time. I came to Tennessee in October to be able to see the fall foliage, but unfortunately the display of it was not as vivid as I had hoped for. This because the weather had not turned into the cooler fall weather, but it was instead still summer-warm with daily record high temperatures Percy Warner Park. The park was a little more crowded than what we would have expected, not only caused by the good weather but also by an ongoing race, but we still had a great time. uuid="A08DD584-D3FA-425F-A583-B1BD8A4C1FBC" id="United States of America lilleulven.com _K3_2867.dng Southern USA Lilleulven.com"
Swain County, Bryson City, North Carolina, United States of America Just one day later and the fall colors start peaking through at Newfound Gap on the Tennessee / North Carolina boarder. uuid="B23BFE9C-918F-4E4A-B892-55B92123686D" id="United States of America lilleulven.com _K3_3455-2-2.dng South-Eastern USA Lilleulven.com"
Haywood County, Maggie Valley, North Carolina, United States of America Plott Balsam Range, where on one of the eastern slopes a German immigrant's son, Henry Plott, made his home in the early 1800's. 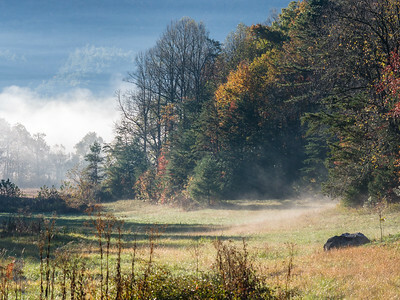 In this area, Henry Plott and his descendants, developed the famous Plott Bear Hounds. uuid="51333AC6-8AC3-4053-A879-2D37B9D66519" id="United States of America lilleulven.com _K3_3541.dng South-Eastern USA Lilleulven.com"
Jackson County, Sylva, North Carolina, United States of America After some not so promising fall colors in the Great Smoky Mountains National Park we were surprised to find stunning colors only a few miles further on on the Blue Ridge Parkway. 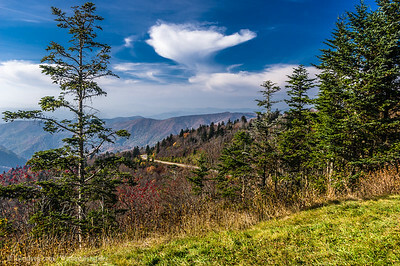 This photo was taken from the Waterrock Knob Visitor Center at mile 450 (we started our tour backwards at mile 469). uuid="8DF9CFFE-231D-443D-87A0-BDD2CC6D99B9" id="United States of America lilleulven.com _K3_3576-2.dng South-Eastern USA Lilleulven.com"
Swain County, Cherokee, North Carolina, United States of America Sherrill Cove Tunnel on the Blue Ridge Parkway has an average elevation of 932 metres (3,058 feet). 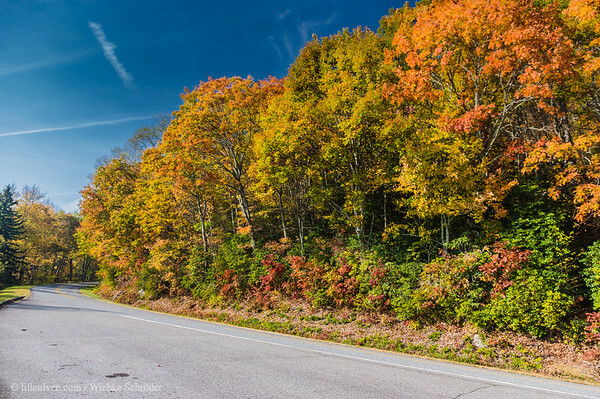 The Blue Ridge Parkway has 26 tunnels of which 25 are located in North Carolina. I had been too deep in my own thoughts to notice the light and the colors on this tunnel when Solo mentioned it to me, wondering why I hadn't asked him to stop. We thought to see if the next tunnel after this would give us the same kind of light and colors, but when it did not Solo turned the car around and took me back to Sherrill Cove Tunnel so that I could get the best fall colors photographed taht we had seen since our search for fall colors had started. uuid="7181D30C-93DB-47A7-93BA-675AD225A9E2" id="United States of America lilleulven.com _K3_3492-2-2-2-2-2.dng South-Eastern USA Lilleulven.com"
Sevier County, Gatlinburg, Tennessee, United States Newfound Gap is with its elevation of 5046 feet the lowest drivable gap through the Great Smoky Mountains National Park. Originally it was believed that Indian Gap, about 1.5 miles west of Newfound Gap, was the lowest pass through the Great Smoky Mountains. This was found invalid in 1872 when a Swiss geographer, Arnold Henry Guyot, measured many of the Smoky Mountain's elevations with a barometer and discovered that Newfound Gap actually was the lowest point. uuid="95135B61-63A1-4E94-9C14-3FF80591787C" id="United States lilleulven.com _K3_3133.dng Southern USA Lilleulven.com"
Sevier County, Gatlinburg, Tennessee, United States of America uuid="7DE5B57E-58CB-4461-8282-5B608993C0C3" id="United States of America lilleulven.com _K3_2868.dng Southern USA Lilleulven.com"
Swain County, Bryson City, North Carolina, United States of America Solo took me to watch the sunset from Clingmans Dome, where – during my first visit to the park in 2013 – I had made some great photos before. This time we found ourselves in a line of photographers all waiting for the sunset to come, and by pure chance I happend to stand in the very same spot I had been waiting for the sun to set in 2013. This time however I thought to be smarter and had taken a warm jacket and gloves with me, but still it was not enough to keep warm for the photoshoot, so Solo borrowed me his anorak, thinking to evacuate into the car if it would get too cold. I still was freezing... uuid="D4B11E51-E4F0-42C5-A133-A5F9AB96CE00" id="United States of America lilleulven.com _K3_3211-2-2-2.dng South-Eastern USA Lilleulven.com"
Cades Cove, Townsend, Tennessee, United States of America The hunt for the best fall foliage led me to visiting the Great Smoky Mountains National Park. 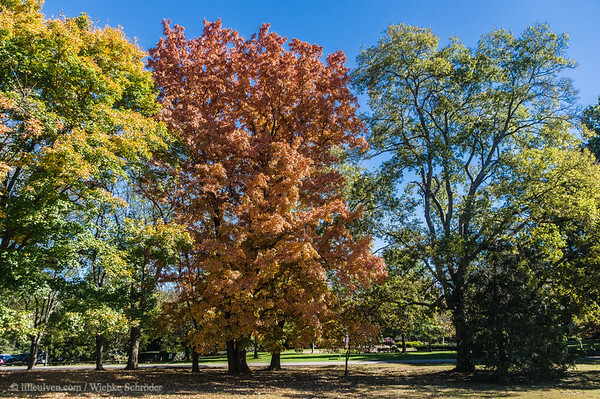 While usually at this time of the year the fall foliage would have been at its peak, this year it was delayed by a month due to an ongoing drought and almost daily heat records in September and October. But another wish of mine, photographing in Cades Cove with some fog came true before I left the National Park to continue my journey on the Blue Ridge Parkway. uuid="31767F26-A3C7-48FC-878E-7954F6B1CEEA" id="United States of America lilleulven.com _K3_3316-2.dng Southern USA Lilleulven.com"
Swain County, Bryson City, North Carolina, United States of America Just one day later and the fall colors start peaking through at Newfound Gap on the Tennessee / North Carolina boarder. uuid="4D1D4C07-9E57-4473-BEBD-B2E7C8FDA562" id="United States of America lilleulven.com _K3_3448.dng South-Eastern USA Lilleulven.com"
Cocke County, Hartford, Tennessee, United States of America The Tennessee Welcome Center in Hartford nicely decorated for the season. uuid="58B800C3-149E-4C17-A30D-43420B283265" id="United States of America lilleulven.com _K3_3605-Bearbeitet.tif Cyanotype Lilleulven.com"
Cades Cove, Townsend, Tennessee, United States of America The hunt for the best fall foliage led me to visiting the Great Smoky Mountains National Park. 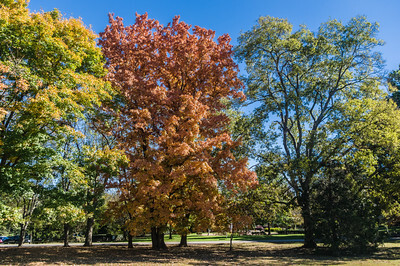 While usually at this time of the year the fall foliage would have been at its peak, this year it was delayed by a month due to an ongoing drought and almost daily heat records in September and October. But another wish of mine, photographing in Cades Cove with some fog came true before I left the National Park to continue my journey on the Blue Ridge Parkway. 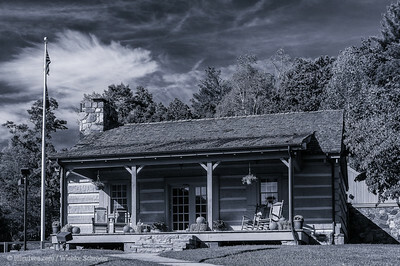 uuid="408F9BEB-0A0C-4F9E-B0FE-BA761B558452" id="United States of America lilleulven.com _K3_3316 HDR 2.psd "
Blount County, Townsend, Tennessee, United States uuid="FDA9AA5A-4F37-4428-8666-77996E8C9D29" id="United States lilleulven.com _K3_3336-2-2-2-2-2-2-2-2-2.dng Southern USA Lilleulven.com"
Cocke County, Hartford, Tennessee • United States The Tennessee Welcome Center in Hartford nicely decorated for the season. Hamilton County, Chattanooga, Tennessee • United States We decided to visit Ruby Falls in Tennessee but not to go on to Rock City Gardens a few miles further south in Georgia. With the haze and the clouds that we had seen, the view from Rock City Gardens did not seem promising to us. 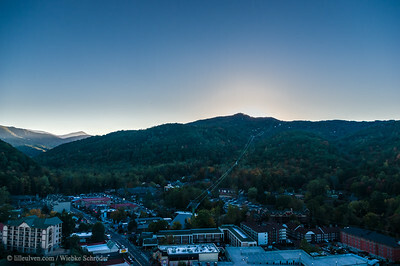 But I took my chance after our visit to Ruby Falls to take some photos of Chattanooga from the balcony. Sequatchie County, Dunlap, Tennessee • United States We decided to visit Chattanooga and the Ruby Falls for a day. On our way along the 111 we found this beautiful overllok and resting place. 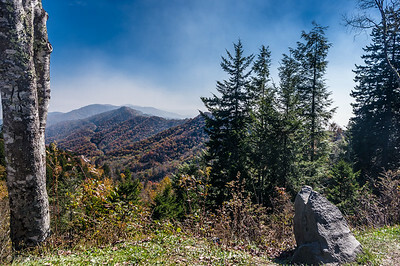 Haywood County, Maggie Valley, North Carolina • United States Plott Balsam Range, where on one of the eastern slopes a German immigrant's son, Henry Plott, made his home in the early 1800's. 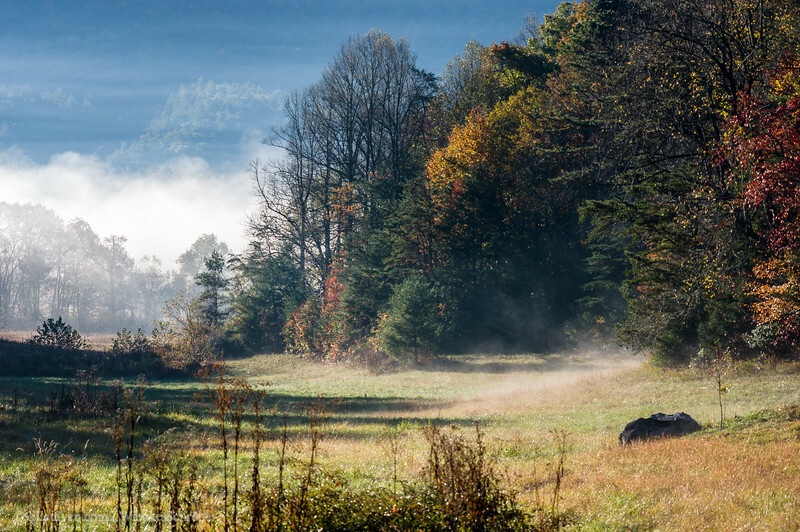 In this area, Henry Plott and his descendants, developed the famous Plott Bear Hounds. Davidson County, Nashville, Tennessee • United States Before meeting up with some friends in Nashville for lunch, Solo took me for a hike to Percy Warner Park. The park was a little more crowded than what we would have expected, not only caused by the good weather but also by an ongoing race, but we still had a great time. 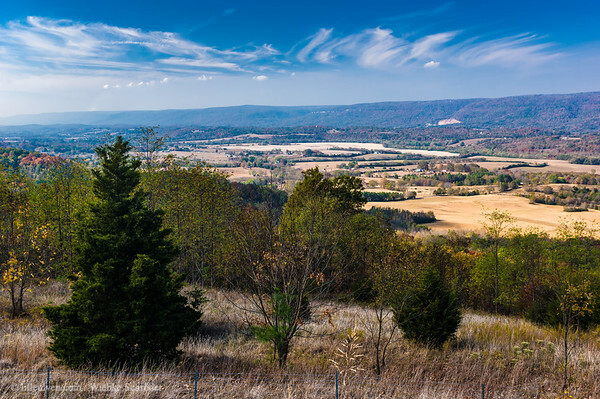 I came to Tennessee in October to be able to see the fall foliage, but unfortunately the display of it was not as vivid as I had hoped for. 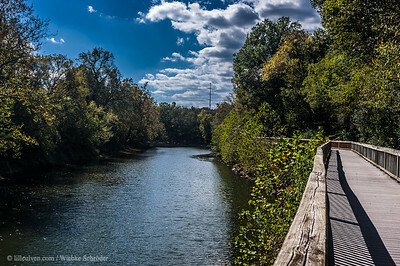 This because the weather had not turned into the cooler fall weather, but it was instead still summer-warm with daily record high temperatures Percy Warner Park. The park was a little more crowded than what we would have expected, not only caused by the good weather but also by an ongoing race, but we still had a great time. 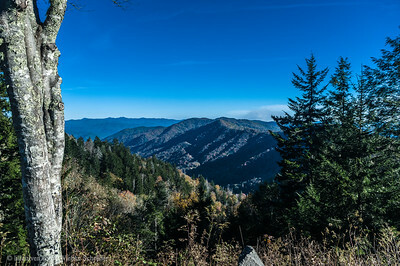 Swain County, Bryson City, North Carolina • United States Just one day later and the fall colors start peaking through at Newfound Gap on the Tennessee / North Carolina boarder. 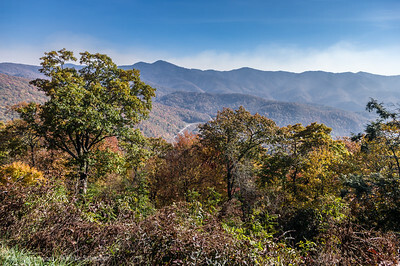 Jackson County, Sylva, North Carolina • United States After some not so promising fall colors in the Great Smoky Mountains National Park we were surprised to find stunning colors only a few miles further on on the Blue Ridge Parkway. This photo was taken from the Waterrock Knob Visitor Center at mile 450 (we started our tour backwards at mile 469). Swain County, Cherokee, North Carolina • United States Sherrill Cove Tunnel on the Blue Ridge Parkway has an average elevation of 932 metres (3,058 feet). 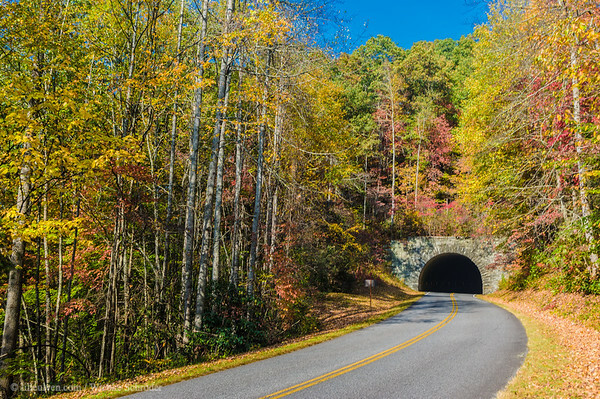 The Blue Ridge Parkway has 26 tunnels of which 25 are located in North Carolina. I had been too deep in my own thoughts to notice the light and the colors on this tunnel when Solo mentioned it to me, wondering why I hadn't asked him to stop. We thought to see if the next tunnel after this would give us the same kind of light and colors, but when it did not Solo turned the car around and took me back to Sherrill Cove Tunnel so that I could get the best fall colors photographed taht we had seen since our search for fall colors had started. Sevier County, Gatlinburg, Tennessee • United States Newfound Gap is with its elevation of 5046 feet the lowest drivable gap through the Great Smoky Mountains National Park. Originally it was believed that Indian Gap, about 1.5 miles west of Newfound Gap, was the lowest pass through the Great Smoky Mountains. 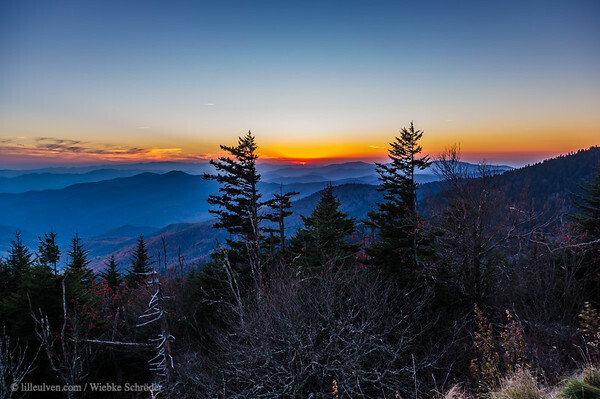 This was found invalid in 1872 when a Swiss geographer, Arnold Henry Guyot, measured many of the Smoky Mountain's elevations with a barometer and discovered that Newfound Gap actually was the lowest point.